Thanks. I needed that. You give an actual picture of the man related to his job and position in the real world. I feel introduced to someone I hadn’t met. And Shelley’s Ozymandias is about one of the most beautiful bits of poetry ever constructed by anyone. Thanks for that, too. Thanks for the kind words, and we agree about the poem. Cottect he d0oes move Fast, but why Perthy W..Australia? 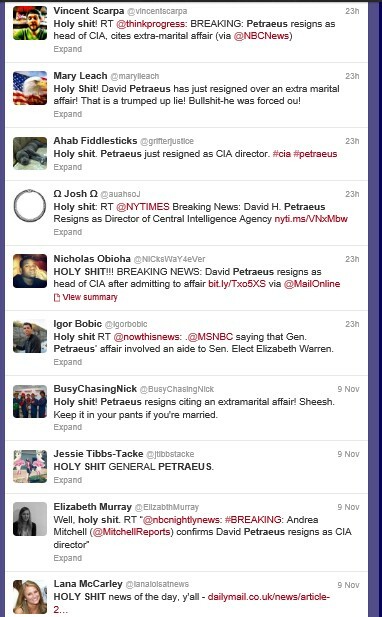 Petraeus had been scheduled to give evidence on Thursday 8th but after that hearing was dropped when he resigned Thursday 8th due to revelations of an affair with his biographer, Paula Broadwell. Some Republicans hinted he had resigned not because of the affair but to avoid giving evidence. Under pressure, he agreed to testify, and the hearings were rescheduled for Friday 16th. But on Tuesday 13th he was in Perth ABC press meeting, just after he had resigned on Thursday 8th just 5 days after Dems election win 3rd/4th he had resigned, on Friday 9th with President at Whitehouse I think I read so if he flew 10th or 11th arrival in Perth WA 13th over the date line ~ wow that was a quick run and preplanned I guess. Because then he was on WA Press conference Tuesday 13th, back to usa 14th over date line for Friday 16th in Senate & House hearings. O-B-I-1 & Barrack HOUSE-CLEANING program.! Problem with all 3 Generals as we always said Chief of Staff & Commander in Chief needed a 2nd Term to grow Balls and expunge 3 generals so far, who’s next on Obi-Can-no-Be President a 3rd time but he can clean house for Billary Clintonus? Look for the 2016 GOP Presidential Nominee sticker to Know with Romney now shunned by all Republicans of Power. “Let the games begin” said Heracles or his father Zeus as the progenitors of the Games.